Just “across the pond” we can offer you history, culture, great cities and civilizations, and landscapes that are mythical in their proportions. Europe is an easy and fascinating vacation wonderland for the international traveler. We like the European people, their accents, foods, cultures, wines, beer…and Europe has it all! Our European vacation programs are exceptional in scope, variety and VALUE! . 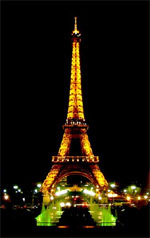 Let your imagination wander and, wherever it stops, we can have you there before you can say Eiffel Tower! Mais oui?